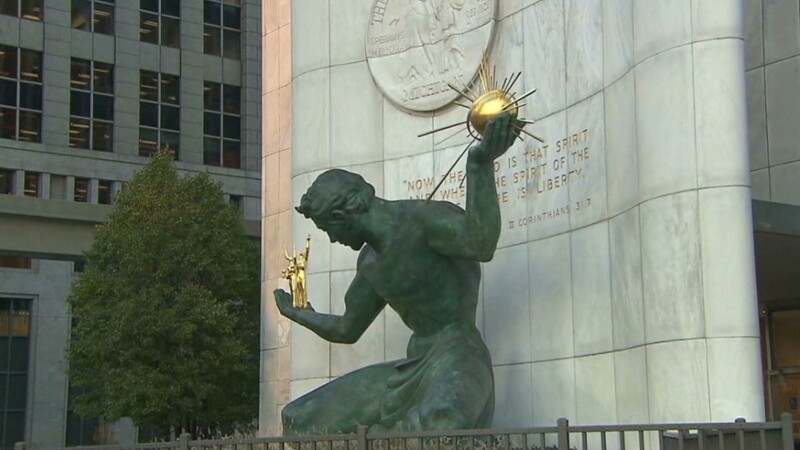 A federal judge ruled this week that current and retired Detroit city workers could see their pensions slashed as the city moves forward with its historic bankruptcy proceedings. For years it was an ironclad part of the compact between government workers and their bosses: The pay wasn't as good as in the private sector, but the retirement benefits were great -- and virtually guaranteed. That's not always the case anymore. A federal judge this week ruled that current and retired Detroit city workers could see their pensions slashed as the city moves forward with its historic bankruptcy. On the same day, Illinois approved a landmark pension overhaul that will result in benefit cuts for nurses, teachers and other current and retired state employees. In California, the bankrupt city of San Bernardino could be heading toward a pension fight, while a group of mayors is pitching a ballot measure to lay the groundwork for benefit cuts for current workers across the state. As pension bills have grown, many cities and states nationwide have already cut benefits for new hires. But some of the most troubled are looking to trim pensions that have already been promised to current and retired public workers -- a move typically seen as off limits. "They made their contributions. They were promised a benefit. The employees have a right to be upset," said Jean-Pierre Aubry, assistant director of state and local research at the Center for Retirement Research at Boston College. Aubry said he believes most public pension systems can be made sustainable without such extreme steps, but that "something has to be done" in Detroit and Illinois. In fact, workers and retirees in cities like Detroit have the most to lose. 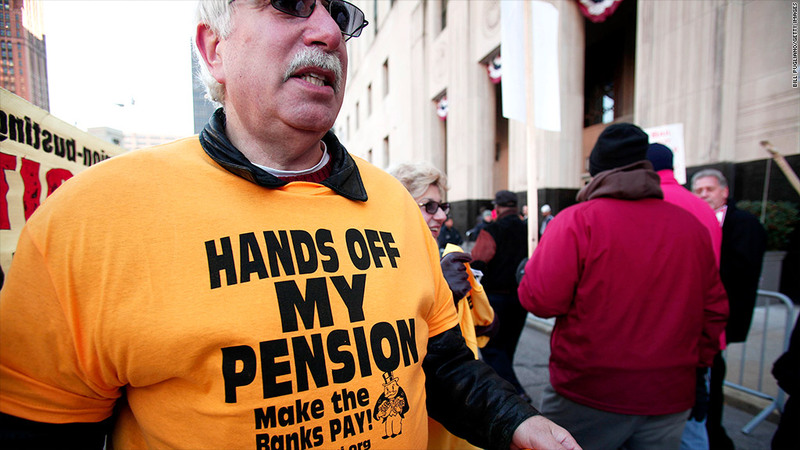 Opponents have argued that pensions are protected, even in bankruptcy, by Michigan's constitution. But in Tuesday's ruling, Judge Steven Rhodes said that federal law trumps state law -- leaving pension cuts on the table. It's unclear how deep the cuts could be in Detroit. But it's likely that both workers and retirees will see some reduction of their pension benefits, which are already relatively modest compared to other large cities. For example, a general city employee in Detroit, such as a sanitation worker, who retired in 2011 with an average final salary of $60,000 and 30 years of service would receive about $33,000 a year. The city's retired firefighters and police officers receive more generous pension checks, but like many public safety workers, they typically don't get Social Security. A 30-year veteran of the fire department who retired last year with an average final salary of $60,000 would have qualified to receive around $44,000 a year. On top of possible pension cuts, Detroit workers and retirees are likely to see deep cuts to retiree health benefits, which could lead to higher monthly health care bills. Emergency Manager Kevyn Orr has also proposed freezing any future pension benefits for current workers, who would be shifted to a 401(k)-style plan moving forward. In Illinois, both workers and retirees will be affected, though the cuts aren't as extreme. Retirees will not suffer cuts in current checks, but the growth of their annual payments will slow significantly. Currently retirees receive 3% annual increases. So an initial $40,000 pension benefit becomes more than $50,000 after 10 years, more than $70,000 after 20 years and so on. Under the new plan, annual increases will only apply to a portion of pension payouts, based on a formula using years worked. For example, a retired teacher with 30 years on the job will receive 3% increases on only the first $30,000 of pension benefits, a base amount that would be tied to inflation. The longer a worker is retired, the more the change will be felt. A retired teacher who spent 30 years on the job and has a $48,000 pension would lose more than $8,000 in five years. Over 25 years, the loss would grow to more than $225,000, according to We Are One Illinois, a coalition of labor unions. Younger people will take the biggest hit under the deal, which raises the retirement age for workers 45 and under and eliminates a handful of annual bumps entirely for younger workers. We Are One contends that the increased retirement age alone cuts the value of pensions by 30%.